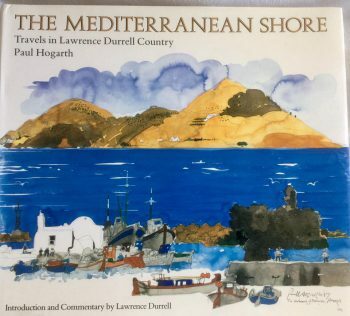 Paul Hogarth’s 1988 book of paintings and observations on the works and landscapes of Lawrence Durrell is for me, amongst some of his finest work. As a fan of both Hogarth and Durrell this is a dream combination and one which Hogarth himself was especially fond. Following on from his successful study of Graham Greene’s landscape in Graham Greene Country Hogarth stuck with the formula of narrative by both himself and the author along with diary notes and introductions to the books and characters. Hogarth loved the Mediterranean and it is clear it was a project he relished the chance of doing. 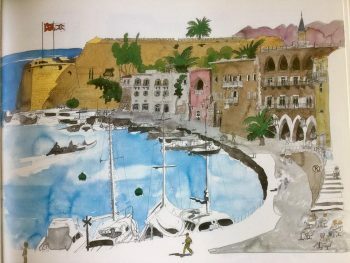 Durrell’s settings for his novels were the stuff of whitewashed walls and deep blue waters, achingly evocative of a lost era, a landscape steeped in Durrell’s sense of romance and history. Where Durrell captures the imagination with his poetic prose then surely Hogarth achieves the same in his watercolours. Sparse trees set upon rocky hill tops, monuments from past civilisations casting shadows across the sun-bleached ground, Hogarth’s famous solitary figures giving a sense of the present to its glorious past. 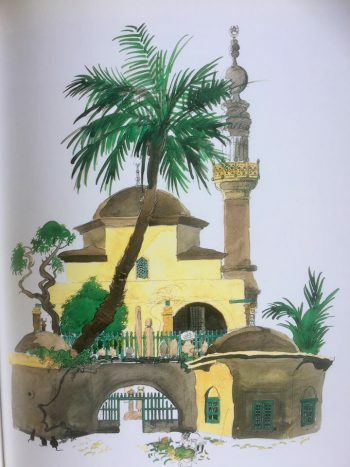 I love this painting of the mosque with its unashamedly obtrusive leaning palm which Hogarth chooses not to omit, the woman working in the foreground, her head and body covered from the harsh sun, the three stray cats lingering. The shading of the buildings, it captures the heat, stillness and history of the region. 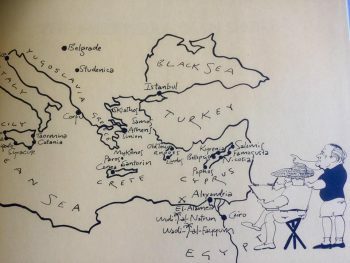 Hogarth worked on the project during 1987, the list of destinations reads like an ancient travel guide; the Nile delta and dessert featured in The Alexandria Quartet, the Roman and medieval settings of The Avignon Quintet, the Acropolis and Golden Horn from The Revolt of Aphrodite, Switzerland, Yugoslavia, the list goes on. By the time of the book Durrell’s health was beginning to wain, he smoked heavily for years and was by then being treated for emphysema but his enthusiasm for the project remained undiminished. They enjoyed one another’s company and Hogarth was introduced to Durrell’s brother Gerald in Provence. 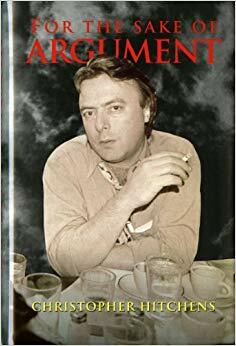 In his autobiography Drawing on Life the artist describes how he stayed at ‘the agreeable Hotel d’ Europe’ whilst he went in search of landscapes depicting scenes from The Avignon Quintet. I must confess to a degree of envy for such a life lived by both men but more especially Hogarth who combined his love of literature with his passion and talent for painting. By the time of Durrell’s death in 1990 they had become good friends, often drinking and dining together in Sommières, their collaboration proved successful and had driven Hogarth hard to find and capture places which bore a close resemblance to Durrell’s own vision. Durrell himself wrote a lengthy introduction and pronounced the book ‘a wonderful intellectual adventure’. The book is a joy in its own right, if you enjoy the writing of Lawrence Durrell then it is a must. Hogarth’s work deserves to be remembered, he, like Durrell lead an enviable life and that shines through in every painting on every page.